A handful of mega-cap technology stocks like Amazon (AMZN), Facebook (FB) and Netflix (NFLX) have led the market’s recent run, pushing the Nasdaq Composite index to a record high above 6,200. Never mind that the rest of the market is lagging behind (just 68 percent of the S&P 500 is in an uptrend vs. 80 percent back in March) or that on up days like last Thursday there was more volume in declining issues than advancing ones on the NYSE. Ignore the fact that tech insiders are aggressively selling their own shares. Or that just five tech stocks have been responsible for 40 percent of the S&P 500's market capitalization gains so far this year. This feels, in some ways, reminiscent of the go-go years of the first dot-com bubble. The companies involved are different in significant ways — most are profitable, for example. And yet, as investors chase growth, hype and hope have in some cases once replaced fundamentals and rationality. Investors, against their better judgement, are again getting caught in the whirlwind. The scale of the tech surge is just breathtaking. Investor inflows into tech stocks is at a 15-year high. The market cap of many tech giants is greater than the economic output of many large cities, according to Bank of America Merrill Lynch, with Alphabet (GOOG) bigger than Chicago and Amazon bigger than Washington, D.C. And at $1.45 trillion, the combined market cap of Alphabet and Apple is larger than the combined market cap of all Eurozone and Japanese banks. We've exceeded a high of the dot-com bubble by one measure: The ratio of U.S. growth stocks to global value stocks. Moreover, Bank of America Merrill Lynch notes that the ratio of global stock market capitalization vs. global GDP is on track to exceed the all-time highs set in 1999 and 2007. The momentum behind these big tech stocks is hard to dismiss. But it ignores the fact that these stocks aren’t cheap — and, in some cases at least, that the growth that investors are chasing at any price may not materialize. Many of these tech favorites faces very real risks. Look at Facebook. It's up by a third year-to-date and has tripled since 2014. Investors are looking past warnings from management about a slowdown in ad sales growth (which will come down "meaningfully," according to the company's CFO) and the need to increase investment spending (up 50 percent this year according to management). Apple (AAPL) is up more than 70 percent from its May 2016 low and up more than a third so far this year despite reporting mixed results earlier this month on weaker-than-expected iPhone sales. All eyes are on the upcoming launch of the iPhone 8 amid growing evidence of smartphone market saturation and increased competitive pressure from the likes of Samsung. It better be a home run, because nearly two-thirds of Apple's revenue comes from the iPhone. Tesla (TSLA) — which is now worth more than Ford (F) and General Motors (GM) — is up more than 80 percent from its November low on the belief CEO Elon Musk is going to reinvent the transportation industry as we know it. But the company isn't profitable (reporting a GAAP loss of $330 million last quarter), is burning through cash rapidly (down $620 million last quarter) and has been actively diluting shareholders with new secondary equity issues. Moreover, investors are ignoring risks associated with the ramp up of the Model 3 and the fear — expressed by Musk himself — that the cheaper sedan could cannibalize sales of the Model S. Production of the Model 3 is expected to start later this summer before ramping up aggressively, providing a clear "do-or-die" moment for the bulls. And Netflix shares are up nearly 65 percent from their pre-election low thanks to building hype for new content such as season five of “House of Cards.” Investors are looking past growing competitive threats (Facebook is launching its own programing later this year) and the fact that net subscriber additions missed estimates last quarter. But a few other measures suggest there could be even more upside frenzy before the speculative fever breaks. 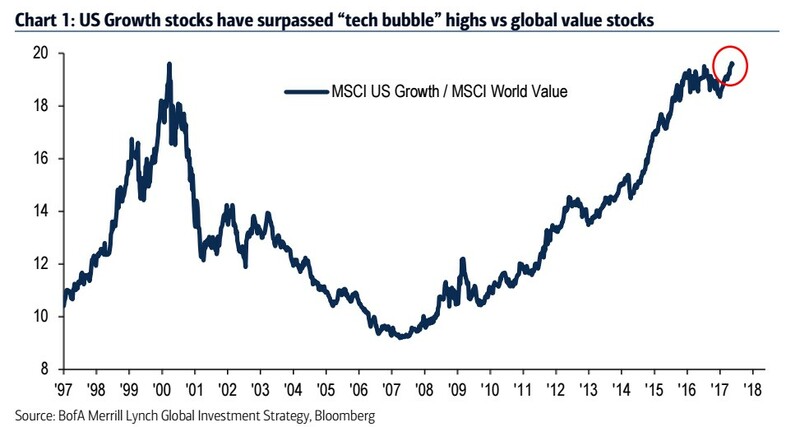 The global MSCI tech sector price-to-earnings ratio is at 18, well below the March 2000 peak of 50. Tech earnings are expected to grow 16 percent this year. And the Nasdaq Internet Index is carrying a price-to-earnings ratio of 61 and has gained 110 percent, compared with a 205 P/E ratio and a 375 percent rise for the Nasdaq 100 in 2001. This isn’t the dot-com bubble. But we are witnessing some irrational exuberance just the same.